The Pacific Ocean (from the Latin name Mare Pacificum, "peaceful sea," bestowed upon it by the Portuguese explorer Ferdinand Magellan) is the largest of the Earth's oceanic divisions. It extends from the Arctic in the north to the Antarctic in the south, bounded by Asia and Australia on the west and the Americas on the east. The equator divides it into the North Pacific Ocean and South Pacific Ocean. (Alternatively, the southernmost part of the Pacific Ocean is sometimes considered to be part of the circum-Antarctic Southern Ocean.) 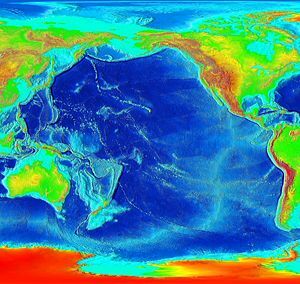 The area of the Pacific Ocean, excluding adjacent seas, is judged to be between 63.8-70 million square miles (165.2-181.3 million square kilometers), which is twice the area of the Atlantic Ocean and greater than the total land area of the planet. The Pacific Ocean comprises about 46 percent of the Earth's water surface, and about 32 percent of its total surface area. Its mean depth is 14,040 ft (4,280 m). The western Pacific has many peripheral seas. With Asian countries on the western Pacific rim projected to continue their economic growth and emergence as centers of technological innovation, and the United States standing as an established leader in these arenas, the signs point clearly to the rise of a new pan-Pacific zone of international power, and increasing cultural exchanges between the East and the West. Peaceful cooperation and mutual understanding are indispensable for sustained development around the Pacific rim basin and for the establishment of a safe global environment. The fisheries of the Pacific, which provide more than three-fifths of the total world catch, are now suffering from overfishing and environmental pollution, and populations can only be maintained through an international effort. Water temperatures in the Pacific vary from freezing in the poleward areas to about 25-30°C(Celsius) (77-84°F) near the equator. The Pacific Ocean is generally warmer than the Atlantic ocean. Salinity also varies latitudinally. Abundant equatorial rainfall throughout the year, and belts of calms and variable winds near the equator, make the water near the equator less salty than that found in the mid-latitudes. The lower wind speeds and cloudy skies of the equatorial regions mean a lower rate of evaporation. Salinity in the equatorial belt can be as low as 34 parts per thousand. Poleward of the temperate latitudes salinity is also low, because little evaporation of seawater takes place in these frigid areas. In the open Pacific, the highest surface salinities, 37 parts per thousand, occur in the southeastern region. In the northern trade-wind belts, salinity only occasionally reaches 36 parts per thousand. The salinities of the Pacific waters near Antarctica are less than 34 parts per thousand, and the lowest salinities, those of less than 32 parts per thousand, occur in the extreme northern zones. In the western Pacific, heavy rainfall associated with the regional monsoons keeps salinity relatively low. Seasonal variations there, and in the eastern Pacific where seasonal weather causes changes in surface currents, are significant. The surface circulation of Pacific waters is generally clockwise in the Northern Hemisphere (the North Pacific Gyre) and counter-clockwise in the Southern Hemisphere with the axes of the North and South Equatorial currents coinciding, respectively, with the parallel of 15°N and the equator. In between the Equatorial currents, a well-defined counter-current, the axis of which is always north of the equator, extends from the Philippines to the shores of Ecuador. The North Equatorial Current, driven westward along latitude 15°N by the trade winds, turns north near the Philippines to become the warm Japan or Kuroshio Current. Turning eastward at about 45°N, the Kuroshio forks, and some waters move northward as the Aleutian Current, while the rest turn southward to rejoin the North Equatorial Current. The Aleutian Current branches in the region of 160°E, as it approaches North America and forms the North Pacific Current. Surface waters move in a counter-clockwise circulation in the Bering Sea. Its southern arm becomes the chilled slow, south-flowing California Current and forms the eastern segment of the returning branch of the North Equatorial Current. The southward extension of the Kamchatka Current becomes the cold Oya Current, flowing to the east of the Japanese island of Honshu to meet the warm Kuroshio waters in the vicinity of 36°N. The South Equatorial Current, flowing west along the equator, swings southward east of New Guinea, turns east at about 50°S, and joins the main westerly circulation of the Southern Pacific, which includes the Earth-circling Antarctic Circumpolar Current. As it approaches the Chilean coast in the region of 45° S, the Antarctic Circumpolar Current divides; one branch flows around Cape Horn and the other turns north to form the Peru or Humboldt Current. The two westernmost branches of the South Equatorial Current, on reaching the east coast of Australia, swing south to form the East Australian Current, which, becoming the Tasman Current, turns back to the northeast and dissipates west of New Zealand. The easternmost branch flows first to the south, roughly along the 180° meridian, before turning back to the east in the vicinity of 50°S as the warm South Pacific Current; between 80° and 90°W this flow turns northward and then westward as the Mentor Current, the waters eventually returning to the South Equatorial Current. At periodic intervals of three or four years, unusually warm ocean conditions off the tropical coast of South America and changes in tropical atmospheric patterns (Southern Oscillation) cause an anomaly of ocean currents and climatology in the South Pacific called El Niño. This event can adversely affect fishing, agriculture, and rainfall patterns along the west coast of South America, and sometimes causes weather anomalies in the equatorial and southern Pacific and in northeastern South America, Asia, and North America. 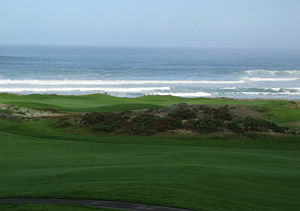 View of the Pacific Ocean from Pebble Beach, California. The Pacific ocean sea floor comprises two major zones, distinguished by the type of primary rock in each: The Central Pacific Basin characterized by mafic igneous rock and the submerged continental margins characterized by felsic igneous rock. Geologists identify the narrow zone of transition between these two zones as the andesite line. It follows the western edge of the islands off California and passes south of the Aleutian arc, along the eastern edge of the Kamchatka Peninsula, the Kuril Islands, Japan, the Mariana Islands, the Solomon Islands, and New Zealand. The dissimilarity continues northeastward along the western edge of the Andes Cordillera along South America to Mexico, returning then to the islands off California. Indonesia, the Philippines, Japan, New Guinea, and New Zealand—all eastward extensions of the continental blocks of Australia and Asia—lie outside the Andesite Line. Within the closed loop of the andesite line are most of the deep troughs, submerged volcanic mountains, and oceanic-volcanic islands that characterize the Pacific basin. Here basaltic lavas gently flow out of rifts to build huge dome-shaped volcanic mountains whose eroded summits form island arcs, chains, and clusters. Outside the Andesite Line, volcanism is of the explosive type, and the Pacific Ring of Fire is the world's foremost belt of explosive volcanism. The lateral thrusting of the Eurasian and Australian tectonic plates, toward and over the Pacific floor, are believed to have caused the Pacific island arcs, whose positions correspond to the intersections of the thrust planes with the spherical Earth's surface. The deep basins that lie between the Asian continent and the island arcs were apparently caused by the local downfolding of the Earth's crust; the volcanic and seismic activity along the island arcs are the result of crustal strata weakened by strong upfolding. Intense downfolding on the oceanic side of the island arcs has formed the deep trenches that fringe the line of the island arcs. Major fault lines, such as the San Andreas Fault in California, and volcanism in the coastal cordilleran mountains of North, Central, and South America, suggest a lateral westward movement of the North American and South American plates over the Pacific floor. The floor of the northeastern Pacific has several major fracture zones, which extend east and west, in some cases for thousands of miles. The numerous tropical islands of the Pacific are mainly coralline. The three principal types of coral reef, fringing, barrier, and atoll, as well as the guyots (flat-topped seamounts), which rise within the Pacific from the ocean floor in latitudes north and south of the tropics, can be partially understood by the slow subsidence theory advanced by Charles Darwin during the nineteenth century, and partially by the theory of plate tectonics. The largest landmass entirely within the Pacific Ocean is the island of New Guinea—the second largest island in the world. Almost all of the smaller islands of the Pacific lie between 30°N and 30°S, extending from Southeast Asia to Easter Island; the rest of the Pacific Basin is almost entirely submerged. The great triangle of Polynesia, connecting Hawaii, Easter Island, and New Zealand, encompasses the island arcs and clusters of the Cook Islands, Marquesas, Samoa, Society, Tokelau, Tonga, Tuamotu, Tuvalu, and Wallis and Futuna islands. The northernmost chain of about 2,000 oceanic islands is associated with the Hawaiian Ridge, although only the small group at the eastern end is referred to as the Hawaiian Islands. North of the equator and west of the International Date Line are the numerous small islands of Micronesia, including the Caroline Islands, the Marshall Islands, and the Mariana Islands. Nearly all are coralline. In the southwestern corner of the Pacific lie the coral islands of Melanesia, dominated by New Guinea. Other important island groups of Melanesia include the Bismarck Archipelago, Fiji, New Caledonia, the Solomon Islands, and Vanuatu. Islands in the Pacific Ocean are of four basic types: Continental islands, high islands, coral reefs, and uplifted coral platforms. Continental islands lie outside the Andesite Line and include New Guinea, the islands of New Zealand, and the Philippines. These islands are structurally associated with nearby continents. High islands are of volcanic origin, and many contain active volcanoes. Among these are Bougainville, Hawaii, and the Solomon Islands. During the summer, the heating of air masses over tropical Asia in summer initiates a low-pressure system which is associated with rain-bearing winds called monsoons. This low pressure system becomes the focus of trade winds in both hemispheres. In winter, cooling of the continent results in the development of the Asian high-pressure system, which strengthens the trade winds of the Northern Hemisphere. The western Pacific, south of the sea of Japan, experiences dramatic seasonal contrasts between the continental influences associated with drought and cold, and the maritime influences associated with moisture and heat. The weather in the trade wind belts is generally fine, with little cloud cover and slight precipitation. The equatorial region, in which the trade winds of the Northern and Southern hemispheres converge, is subject to calms known as the doldrums. In the trade wind belts off the west coasts of the American continent, the upwelling of cold, subsurface water cools the overlying air below its dew point (the air temperature at which water vapor condenses as dew), causing widespread formation of low, thick clouds and fog. Maris Pacifici by Ortelius (1589). Probably the first printed map that shows the Pacific Ocean. 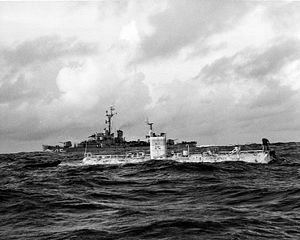 Bathyscaphe Trieste, before her record dive to the bottom of the Marianas Trench, January 23, 1960. Important human migrations occurred in the Pacific during prehistoric times, most notably those of the Austronesians (specifically, the Polynesians), from the Asian edge of the ocean to Tahiti, and then to Hawaii and New Zealand, and much later, to Easter Island. The earliest migrants arrived in Melanesia, and from there gradually moved northward to eastern Micronesia and eastward into Polynesia. These voyages, by means of large sailing canoes, appear to have begun between 3,000 and 4,000 years ago and to have continued until the Maori settled New Zealand about 1,000 years ago. 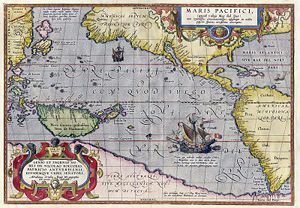 European exploration of the Pacific during the sixteenth century can be divided into three phases: Spanish and Portuguese; Dutch; and English and French. The García Jofre de Loaysa expedition of 1525–1527 crossed the southern Pacific Ocean from east to west, and briefly established a Spanish colony in Tidore. Andrés de Urdaneta (1498–1568) sailed on the Loaysa voyage and studied the winds and currents, surviving the failed colonization effort and demonstrating how a voyage could be made from west to east by sailing north from the Philippines to Japan and catching a wind which could carry it across the northern Pacific to the coasts of North America. This became the main trade route until the explorations of the British and French navies in the second half of the eighteenth century. In 1564, conquistadors led by Miguel López de Legazpi crossed the ocean from Mexico to the Philippines and Mariana Islands in six vessels. In 1567, Álvaro de Mendaña de Neira (1541–1595) sailed west from Callao in Peru to western Melanesia. For the remainder of the sixteenth century, Spanish influence was paramount, with ships sailing from Spain to the Philippines, New Guinea, and the Solomon Islands; the Manila Galleons linked Manila and Acapulco. During this time Ragusan galleys from Dubrovnik, led by Vice Bune, also explored southwestern Pacific, and discovered the islands of the Bismarck Archipelago and Vanuatu (New Hebrides). During the seventeenth century, the Dutch, sailing around southern Africa, dominated discovery and trade. In 1598, five ships left Holland for the Pacific by way of the Strait of Magellan. The Portuguese and Spanish each captured a ship, another was destroyed by the Japanese, and one was lost at sea. Only the ship Faith returned in 1600 with only 36 of the original 491 crew members. In 1616, the Dutch ship Eendracht, commanded by Jakob Le Maire and Willem Schouten found a new way to enter the Pacific other than through the Strait of Magellan. As they sailed west, Dutch sailors encountered islanders in the Tuamotus, Tonga, and New Guinea. In 1642, Abel Janszoon Tasman became the first European explorer to enter the South Pacific from the west and to sail completely around Australia, visiting Tasmania and New Zealand, the Tonga Islands of Haapai, and the Fiji Islands. In 1721, Jacob Roggeveen set sail in search of a great southern continent. On Easter Day, 1722, he landed at Rapa Nui (Easter Island), writing a description of the tattooed inhabitants and large stone statues. On his return voyage he stopped at the northern Tuamotu Islands and the Manua Islands of Samoa. During the seventeenth century, Italian traders from Ragusa prevailed in Melanesia. The eighteenth century marked a burst of exploration by the Russians in Alaska and the Aleutian Islands, the French in Polynesia, and the British in the three voyages of James Cook (to the South Pacific and Australia, Hawaii, and the North American Pacific Northwest). On his first voyage to Tahiti, Cook discovered Raiatea, Vaitoare (Tahaa), Huahine, and Bora-Bora and surveyed the coasts of New Zealand and the east coast of Australia. On his second voyage, he charted Tonga and Easter Island, and discovered New Caledonia, and his third voyage included exploration of the North Pacific and Bering Strait. Cook’s maps and charts were so accurate that many have not been substantially revised. The English explorers John Byron, Samuel Wallis, and Philip Carteret made significant discoveries: Byron explored the northern Marianas and discovered islands in the Tuamotuan, Cook, and Tokelauan archipelagos; Wallis discovered islands in the Tahiti group; and Carteret sighted Pitcairn Island and explored the southern Pacific. The French explorer Louis Antoine de Bougainville sailed to Tahiti, Samoa, Vanuatu, New Guinea, and the Solomons. Growing imperialism during the nineteenth century resulted in the occupation of much of Oceania by Great Britain and France, followed by the United States. Significant contributions to oceanographic knowledge were made by the voyages of HMS Beagle in the 1830s, with Charles Darwin aboard; HMS Challenger during the 1870s; the USS Tuscarora (1873-76); and the German Gazelle (1874-76). Although the United States conquered the Philippines in 1898, Japan controlled the western Pacific by 1914, and occupied many other islands during World War II. By the end of the war, the U.S. Pacific Fleet was predominant in the Pacific. Seventeen independent states are located in the Pacific: Australia, Fiji, Japan, Kiribati, Marshall Islands, Micronesia, Nauru, New Zealand, Palau, Papua New Guinea, the Philippines, Samoa, Solomon Islands, Republic of China (Taiwan), Tonga, Tuvalu, and Vanuatu. Eleven of these nations have achieved full independence since 1960. 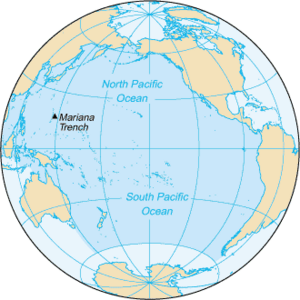 The Northern Mariana Islands are self-governing with external affairs handled by the United States, and Cook Islands and Niue are in similar relationships with New Zealand. Also within the Pacific is the U.S. state of Hawaii and several island territories and possessions of Australia, Chile, Ecuador, France, Japan, New Zealand, the United Kingdom, and the United States. In 1986, the member nations of the South Pacific Forum declared the area a nuclear-free zone in an effort to halt nuclear testing and prevent the dumping of nuclear waste there. The exploitation of the Pacific's mineral wealth is hampered by the ocean's great depths. In shallow waters of the continental shelves off the coasts of Australia and New Zealand, petroleum and natural gas are extracted, and pearls are harvested along the coasts of Australia, Japan, Papua New Guinea, Nicaragua, Panama, and the Philippines, although the volume is sharply declining in some cases. The Pacific's greatest asset is its fish. The shoreline waters of the continents and the more temperate islands yield herring, salmon, sardines, snapper, swordfish, and tuna, as well as shellfish. Among the world's oceans, the Pacific has the greatest variety of plants and animals. The circumglobal mixing of water in the southern and northern polar regions of the Pacific permit the intermingling of flora and fauna from other oceanic regions, while the temperate and tropical surface waters of the Pacific are more likely to have indigenous species. Vast kelp beds of brown algae (genus Laminaria) on the rocky, cold-water coasts of North and South America act like a marine rain forest, harboring a variety of flora and fauna. Concentrations of plankton-feeding fish, such as the Japanese sardine and the Peruvian anchovy, thrive in the surface waters of these same regions. Demersal, or bottom-living, species such as the North Pacific hake and the Alaska pollack abound in the North Pacific. Five species of salmon thrive in the North Pacific, compared to the single species, Salmo salar, of the Atlantic. A wealth of marine animals exist in the warm, tropical region between the North and South Equatorial Current systems. Unique Indo-Pacific marine forms have evolved in the warm monsoonal climate and variegated landforms. The richest and most extensive coral reefs of any ocean are found in the western Pacific, with approximately six times more species of fish than the coral reefs of the Atlantic Caribbean. Six species of tuna, one of which is endemic, roam the tropical Pacific, furnishing more than half of the world's tuna catch. Whales are prominent in the Pacific marine biosphere; many species make regular, long-distance migrations from cold-water feeding grounds to warm-water breeding and calving grounds. Fish catches in the Pacific represent three-fifths of the total world catch, partly due to the large population densities in Asia. Japan and Russia have the largest fisheries in the world (measured by tonnage caught), but China, the United States, Peru, Chile, South Korea, and Indonesia are also among the world's major fishing nations. The fishing industries in all of these countries are based at least partially on fisheries in the Pacific. A number of species, including sardines, herring, anchovies, hake, pollack, and shrimp, have been fished up to, if not beyond, the limits of their sustainable yields. Salmon fisheries are significant for the United States, Japan, Russia, and Canada, while tuna fishing is an important industry for the small island nations of the Pacific. Many of the tuna are found within the 200-mile exclusive economic zones of the island nations, giving them the opportunity to demand fees from foreign fishing boats for fishing rights, and to develop tuna fisheries and processing facilities. Economic and industrial growth and population increases in several coastal regions of the Pacific have resulted in overfishing and the impairment of habitat for a number of coastal species. Aquaculture is being developed to supplement the natural supply. Shrimp, edible and pearl oysters, salmon, sea bream, mullet, and grouper are among the Pacific species that have been successfully cultivated. In the tropical Pacific, pink coral species from the western Hawaiian atolls, and black coral from the western islands and shallow seamounts, and from Malaysian and Indonesian waters, are highly prized for the manufacture of jewelry and ornaments. Marine pollution is a generic term for the harmful entry into the ocean of chemicals or particles. The biggest culprits are rivers that empty into the Ocean, bringing with them the many chemicals used as fertilizers in agriculture as well as waste from livestock and humans. The excess of oxygen depleting chemicals in the water leads to hypoxia and the creation of a dead zone. Another threat to the environment is litter and garbage that is dumped or washed into the sea by rivers in densely populated countries. Recent surveys on remote islands of the Pacific have discovered plastic litter from many parts of the world, carried there by ocean currents. Many ocean birds and mammals die when they mistake colorful pieces of plastic for food. ↑ Britannica Concise, Pacific Ocean. Retrieved July 20, 2007. ↑ Gerlach, Marine Pollution (Berlin: Springer, 1975). ↑ Peoples Association on Countermeasures of Dioxin and Endocrine Disruption, Homepage. (Japanese) Retrieved July 20, 2007. Barkley, Richard A. Oceanographic Atlas of the Pacific Ocean. Honolulu: University of Hawaii Press, 1968. All links retrieved January 9, 2019. Pacific Ocean, CIA World Fact Book. This page was last modified on 9 January 2019, at 17:46.